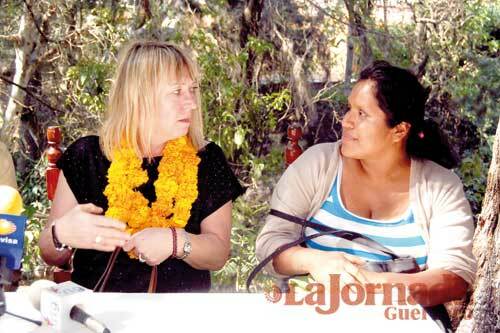 On 23 January, the Delegation of the Initiative of Female Nobel Prize Recipients led by Jody Williams, who in 1997 received the Nobel Peace Prize for her actions in favor of a prohibition of mines, met with female human-rights defenders in the state of Guerrero in an event entitled “Tying our struggles together with our rights.” The visit formed part of the agenda of work and meetings that the delegation has been carrying out in Mexico since 22 January 2012. By means of more than 20 testimonies by women from Guerrero, the Initiative of Female Nobel Prize Recipients came to know about the grave situation of violence against women and female rights-defenders in Mexico, as well as the impacts militarization has on the lives of indigenous woen, who carry out their work in a context of impunity and insecurity. In this way, upon concluding the mission that will continue on into Honduras and Guatemala, the delegation will put together a report with recommendations directed at the governments of the three countries as well those of the U.S. and Canada. The dialogue seeks to reinforce the visibility of these struggles and to make visible the role, support, and actions of the female defenders as well as to demand that the Mexican State guarantee protection for activists who are threatened or at risk. The international delegation also met with Mexican authorities to present them with seven cases of grave rights-violations and to request information regarding the protocol of protection for female defenders, data regarding disappeared women, and the sanctions against functionaries who exercise institutional violence.